Dr Ben Diggles established DigsFish Services in November 2003 to provide specialist aquatic animal health services to industry and Government alike. Dr Diggles has worked with many clients in government, aquaculture, recreational fisheries, and commercial fisheries throughout New Zealand, Australia, Asia and the Pacific Islands. His core business areas include import risk analysis, biosecurity, fish and shellfish health, fish welfare, and development of feeding attractants and medicated feeds for aquacultured finfish. 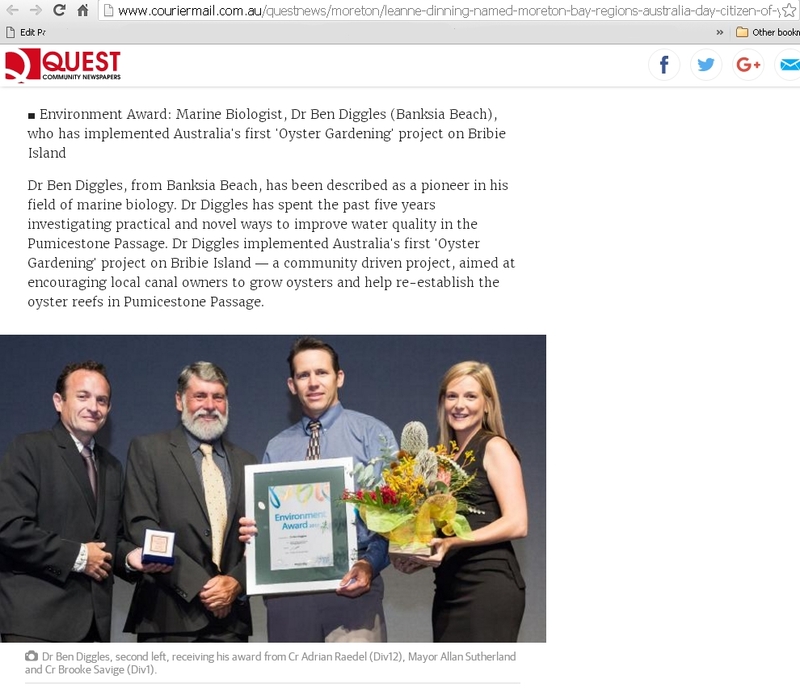 In his spare time Dr Diggles studies the effects of declining water quality on our estuaries, see his presentation on Moreton Bay Oyster Populations, and is active in his local community developing solutions to these problems, like Shellfish Reef Restoration in Pumicestone Passage, where some exciting improvements and results have already been made. Dr Diggles also contributes to indigenous education initiatives through his collaboration with the Marine Ecology Education Indigenous Corporation (MEEIC). Recognition of these activities has included winning the Moreton Bay Regional Council Australia Day Environment Award for 2017. DigsFish Services also developed NEATFish, the worlds first Environmental Standard for Fishing Tournaments, the Aquatic Diseases Field Guide App in Android, iOS and Windows working together with Huxbury Quinn, and Ikijime.com, a worlds first information portal for humane dispatch of finfish. We also conduct taxonomic studies in collaboration with world experts in nematodes, monogeneans and other interesting taxa when required. If you require independent policy advice on issues related to disease risk assessment and prevention, biosecurity and quarantine, aquatic animal welfare, or disease identification and control for any species of fish or shellfish, DigsFish Services is here to help.